Cat’s best “adventure” sled gains more growl, a sleeker coat and sharper claws for on or off trail treks. The wily Cat aficionado knows the 2018 CrossTrek with Cat’s own 794cc dual stage injection two-stroke gains muscle and efficiency plus a slimmer, more streamlined on snow presence. They also know that this “adventure” Cat with its rearview mirrors, mid-height windscreen and generous tunnel-mounted gear bag is as much Sno Pro as it is solo tourer. On trail or off, the CrossTrek series rocks style with performance. Cat’s “adventure” crossover is at home cruising trails or breaking trail. New for 2018, the CrossTrek sports an all-new C-TEC2 twin displacing 794cc and offering more grunt across its rev range than the Suzuki-built 800cc twin that it replaces. We could feel the added midrange in test rides. Cat claims an 18 percent improvement. And we accepted that Cat engineering managed to get up to a 30 percent reduction in oil consumption below 7000 rpm. For those who liked the previous Suzuki 800, they should like the new 800cc Cat C-TEC2 even more. 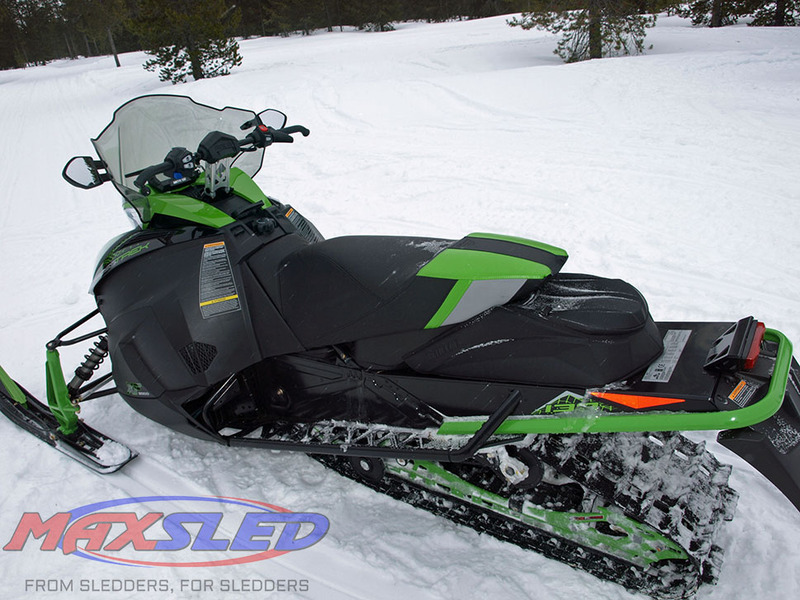 It fits well into the 160-horsepower category of performance models, but it may be outpaced in the near future if Cat itself or other sled makers pick up the challenge dropped down by Ski-Doo’s 850 twin. Of course, if sheer horsepower is what you’re after, there’s always the nuclear option of the 9000-series 200-horsepower turbocharged 998cc four-stroke. The CrossTrek’s 137-inch long Cobra track features 1.6-inch lugs for off trail grip. The capacious rear storage bag can hold overnight gear for a weekend tour. JBassett photo. As an on and off trail ready sled, the CrossTrek with the new Cat twin and Team designed drive train is as close to being a sled for all riders as you’ll get. Its power spins an aggressive Cobra track with a 1.6-inch lug height. Its 137-inch overall length suggests Cat engineering sought a smooth compromise between trail handling and off trail grip. 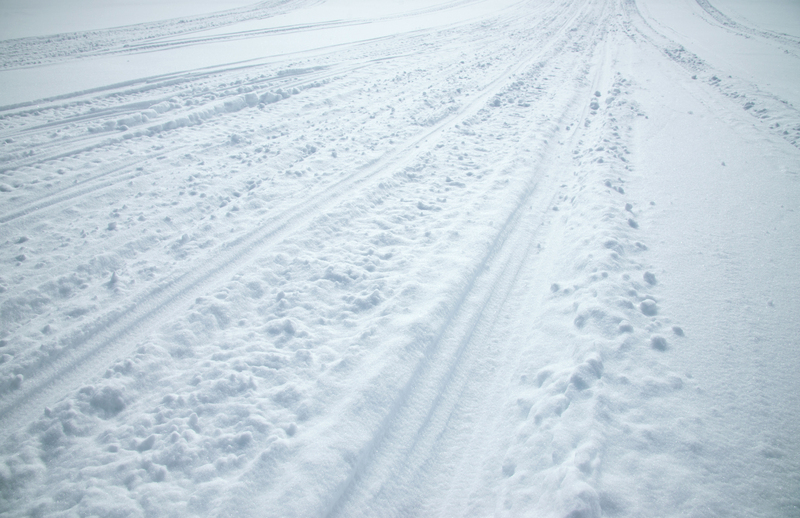 The track lets you maintain a sporting feel when sorting through twisties, but offers good traction for breaking trail after a fresh snow dump. The rear suspension in Cat’s XF chassis will be familiar to Cat riders. 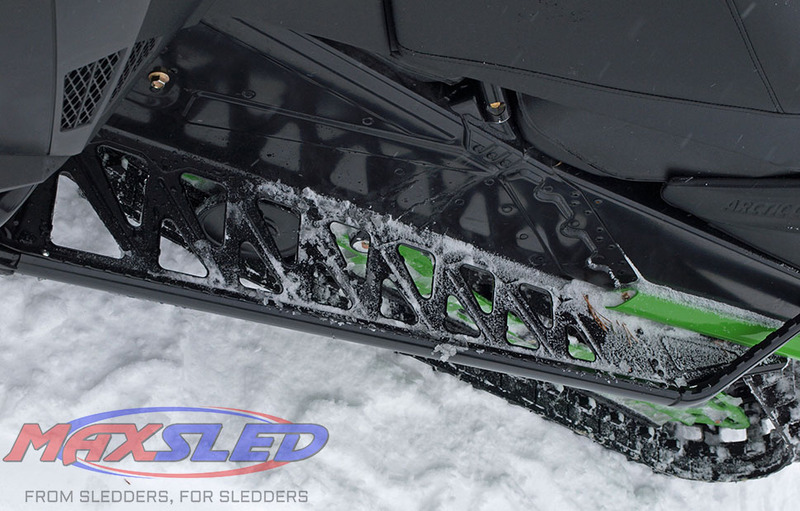 The Slide-Action parallel skid has proven reliable in various Cat performance sleds from El Tigres to RR models. Fitted with Cat’s internal floating piston (IFP) shocks the suspension delivers up to 13.5-inches of travel, more than adequate for attacking bruising bumps. The long travel front suspension combines Cat’s IFP shocks with coil-over-springs to maximize the sled’s 10-inches of travel. You’re not going to find anything revolutionary in the suspensions of this 2018 Cat. 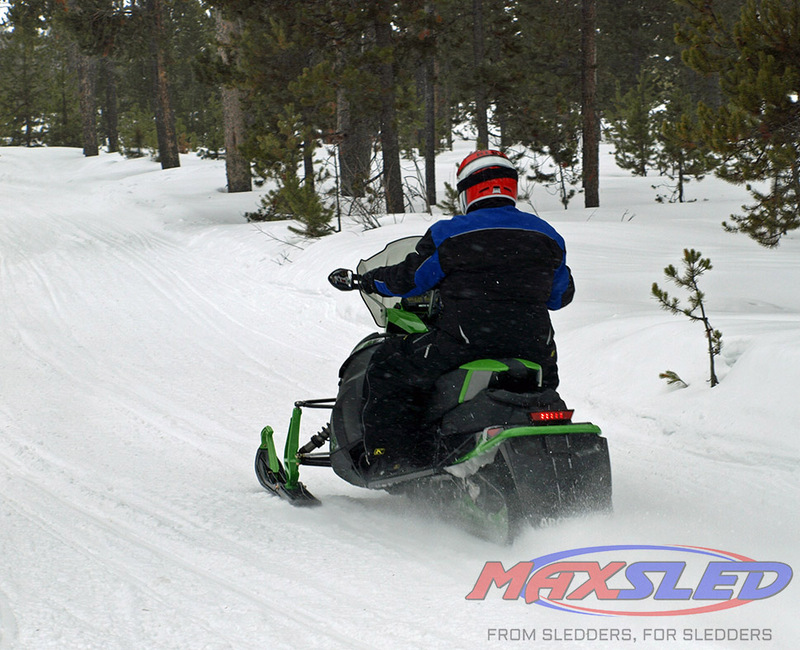 These are time-tested, proven reliable designs that make your time aboard this sled worry-free. The CrossTrek is one of many “Cross” models in the Cat line up for 2018. The Cross Country is an aggressive rendition with a back-country bias. The CrossTour is more touring oriented and includes a voluminous rear storage compartment. The High Country aims at deep snow getaways. The CrossTrek fits in between those and, in our estimation, is the most well-rounded model in Cat’s “crossover” line. Arctic Cat’s new-for-2018 CrossTrek features Cat’s own 794cc dual stage injection two-stroke for muscle and efficiency while adding a slimmer, more streamlined on snow presence. JBasset photo. As with many Cat models for 2018, the CrossTrek enjoys the slimming style provided with the addition of Cat’s Next-Gen body panels. In addition to style, the body panels add functionality as it takes only a quarter turn of the release tabs to access the engine compartment. 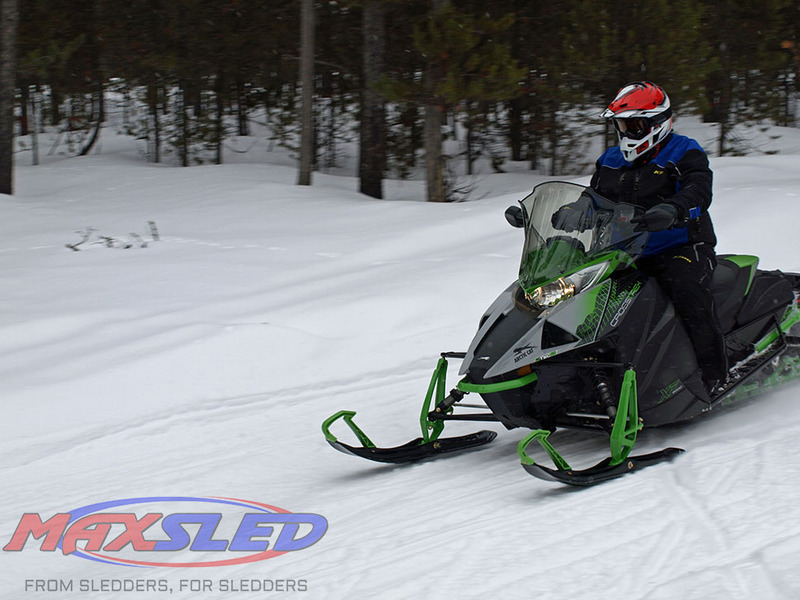 You’ll find this streamlining helps the sled slip through off trail snows easier with less outcropping area to hang up forward motion. Sleek, slimming and purposeful, the Next-Gen panels add an improved presence on and off trail. Of course, power and handling will be the keys to a purchase decision, but the intangibles count as well. The CrossTrek gives you a wind and snow deflecting mid-height windscreen. 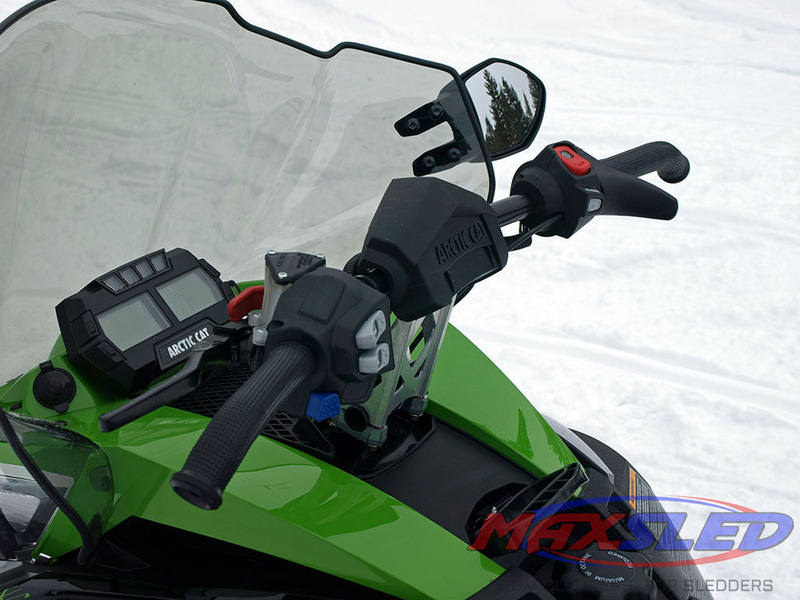 The addition of rear view mirrors attached to the 11-inch high screen lets you keep tabs on other sleds in your group. The CrossTrek is a very versatile sled whether you’re packing on trail miles or running powder. JBassett photo. Ease of operation comes standard as the 8000 CrossTrek comes equipped with electric start and a pushbutton electronic reverse. There’s also a 12-volt outlet for plugging in a heated shield or other devices. Standard fare like the 11-inch tall windscreen and rearview mirrors add ergonomic appeal to an otherwise dual-purpose on/off trail adventure Cat. JBassett photo. The Cat’s handlebar sits on a 5.5-inch riser and can be readily adjusted to provide a near perfect adjustment. 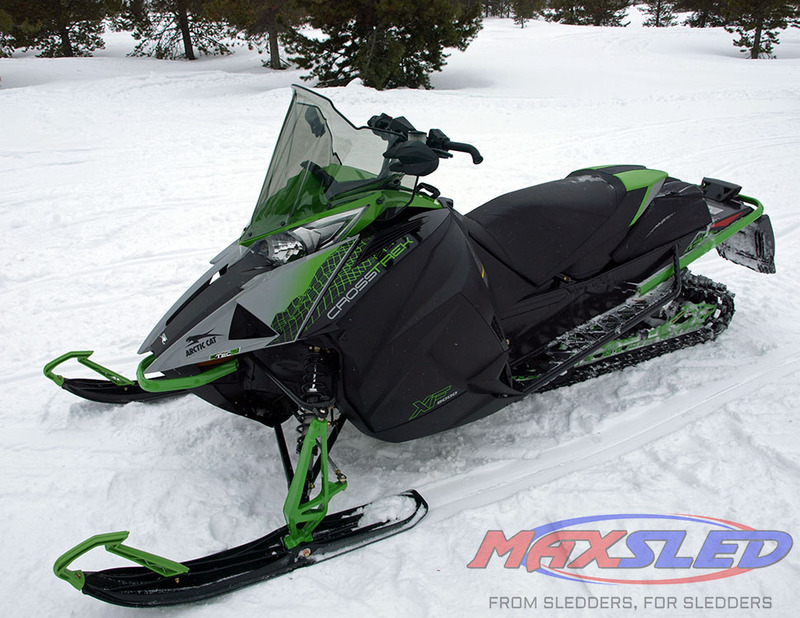 This handlebar with its distinctive curvature has evolved into one of the best in the snowmobile industry. It’s one of those features you won’t really think about all that much, but at the end of a weekend’s ride it will have paid off in overall comfort. The CrossTrek high performance seat comes from the ZR side of the Cat line and is more trail-worthy than the mountain-style design found on the back country-oriented crossover models. If you want added comfort, you can opt for Cat’s heated seat with a high and low heat setting. Should you expect to be doing more off trail riding than on, you might consider adding an optional mountain grab strap. These grippy runningboards with wide snow-clearing cut-outs let you know that the CrossTrek isn’t just a trail-only Cat. JBassett photo. In many cases on-board storage comes at a premium. Cat recognized this and fitted the CrossTrek with a capacious rear-mounted tunnel bag that is said to hold “everything you need on a day or overnight trip.” If it isn’t, no worries. Cat offers a vast list of storage options. As an all-around crossover model, the 2018 8000 CrossTrek ES delivers big time. It’s got plenty of power from low end through a very strong midrange. The suspensions are proven and, frankly, ones we’ve come to admire for their honest functionality. They work well on and off trail. The styling is sleek thanks to new body panels. And this Cat, like virtually all Cats, thrives on performance. The 8000 CrossTrek is a winner, bred with new power. 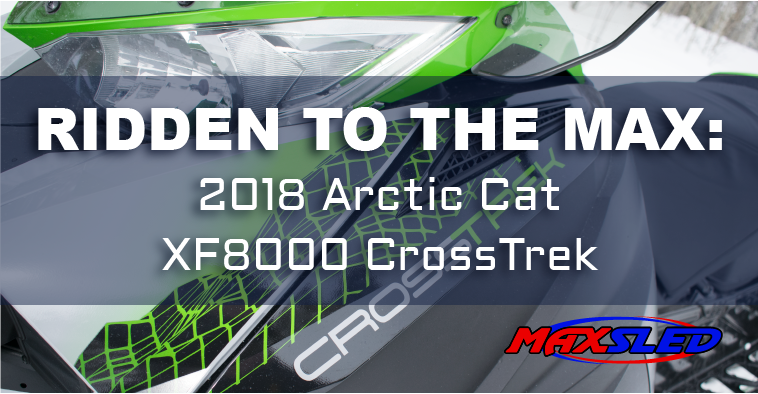 Arctic Cat’s new-for-2018 CrossTrek features Cat’s own 794cc dual stage injection two-stroke for muscle and efficiency while adding a slimmer, more streamlined on snow presence. JBassett photo.